"Sampath Speaking" - the thoughts of an Insurer from Thiruvallikkeni: IPL boycott ~ theatre boycott ~ Bermuda !! In Tamil Nadu, protests are turning the order of the day ! ~ someone has suggested to boycott the first match of IPL at Chepauk so that International attention could be drawn. Here is something on Cricket and a possible alternative !! Do you still remember that 12th match of Group B in ICC WC at Port Spain on 19th Mar 2007. Other than this match, everything about that disastrous WC is forgettable for Indians. The Team led by Rahul Dravid, Greg Chappel was the Coach – had the easiest of draws – the top 2 teams from the pool of India, Bangladesh, Sri Lanka & Bermuda would quality ~ yet Indians failed to qualify ! 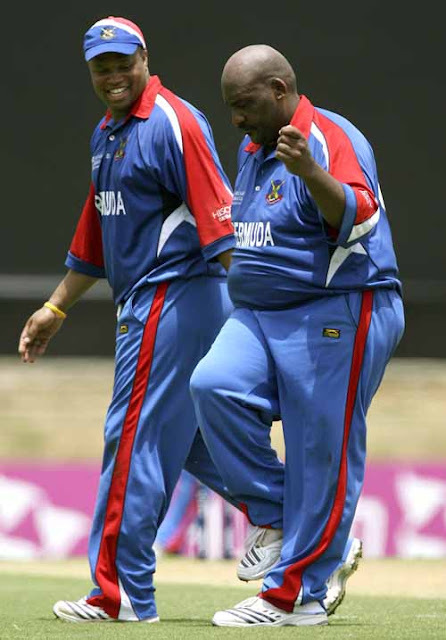 ~ in a game where more focus is on fitness and fielding standards - a 280lb person was an anomaly, a liability, yet Dwayne Leverock with his large frame bowled well and took a great catch to dismiss Robin Uthappa. Beauty and the Beast, Disney’s fairytale romance, is the story of a bison-human hybrid who falls in love with a human woman; of servants cursed and turned into flatware and other household items; of Stockholm syndrome; of an abusive misogynist who eats five dozen eggs a day. But the thing that has gotten people really upset about the film — a live-action remake of the 1991 animated classic — was that one of its characters was gay. The backlash over a gay character appearing in Walt Disney's Beauty and the Beast is rising, putting an Alabama theater and Russian government officials on common ground. A Henagar, Ala., drive-in canceled plans to screen Beauty, while the Russian government mulled banning the film. In some ways, rather than boycotting a game at Chepauk by 40000 odd fans making a localized phenomenon, would it not be a better idea to boycott – all movies / cinema theatres in Tamil Nadu for a week or so. It could be so widespread and if coupled with boycotting all entertainment channels showing movies, the impact could be much stronger and pains felt. How about that ? Boycotts, theatre boycotts at that are not new. The first person known to have reached Bermuda was the Spanish sea captain Juan de Bermúdez in 1505, after whom the islands are named. He claimed the islands for the Spanish Empire. Bermúdez never landed on the islands, but made two visits to the archipelago, of which he created a recognisable map. Bermuda is a British Overseas Territory in the North Atlantic Ocean. Bermuda's two largest economic sectors are offshore insurance and reinsurance, and tourism. Decades back, in 1959 Bermuda was approaching the 350th anniversary of its founding as a British colony and was a thriving travel and tourist destination for wealthy Americans, people that lived on the US east coast and other international travelers wishing to escape their cold climates. And for many of those upscale American tourists Bermuda reminded them of all the comforts back home. But the 28,000 Black Bermudians living there at the time chafed at the Jim Crow like segregation they were subjected to in its hotels, restaurants, schools, theaters, hospitals and other aspects of Bermudian life. Borrowing from the example of the African-American civil rights movement, they decided it was past time to end that discriminatory paradigm. Since the entire island attended the six white-owned segregated Bermuda General Theatres, a group of Bermudians desiring a better government, universal suffrage and an end to segregation held a series of meetings to coordinate a boycott of those segregated theaters timed to start on June 15. The Progressive Group as they called themselves was an airtight secret one that would remarkably maintain that secrecy until they revealed their identities 40 years later. They feared not only retribution from the ruling white oligarchy on the island, they were worried about retaliation against their parents and their future employment prospects in Bermuda. That people's boycott resulted in abolition of segregation in Bermuda hotels and theaters and restaurants. It ignited flares which erupted spectacularly and illuminated the whole shoddy scene that was segregated Bermuda. Learning lessons from that, would it be more apt to boycott theatres and TV serials for a week or so in Tamil Nadu. Would the impact be much stronger ? For Indian Cricket fans, on that WC match in 2007, Robin Uthappa was caught spectacularly by Leverock off Jones for 3. Sourav Ganguly made 89, Virender Sehwag made 114; MS Dhoni 29; Yuvraj Singh 83, Sachin Tendulkar 57* as India amassed 413/5 in 50 overs and registered a thumping win. That India lost to Bangladesh and Sri Lanka and crashed out of the cup is a different sordid tale.